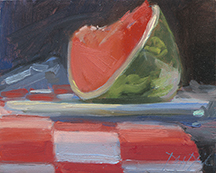 A very popular class will cover the basic principles of oil painting with regard to painting florals, and still life - fruits and vegetables. Includes interesting and memorable discussions on composition, massing, building form, light and shadow: and depending on your own style, knowing when a work is finished (learning how to not overwork your painting). 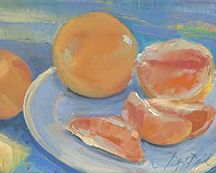 Douglas really delivers sound principles of painting that are an incredible foundation for your painting, whether a beginner or seasoned professional. After the brief morning intro, a very hands-on approach to the class, gets students mixing colors and preparing to paint. Students will work in their own style/technique so that the finished work is their own. 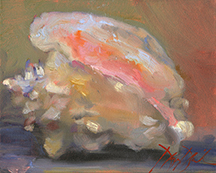 Douglas will overview his palette and concepts that his work entails. Students will mix paints and learn to mix basic strings of color to help comprehend how this preparation makes the painting process a little simpler and gets a working understanding of the value/strings of color. 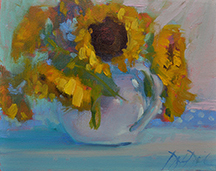 Students will paint from Sunflower, Tulips and some tropical floral that is available at this time of year in Florida. A few fruit and vegetable still lifes-with arrangements of bowls and china plates and bold graphic table coverings, with strong side lighting make for a wonderful alternative subject to the florals.The thought Douglas puts into these classic arrangements and timeless subjects is as important as the painting itself. He will show you how he does it and why he makes the choices he does. A discussion on the pitchers, vases and vessels he chooses along with the cloth and fabric samples he uses will be included.